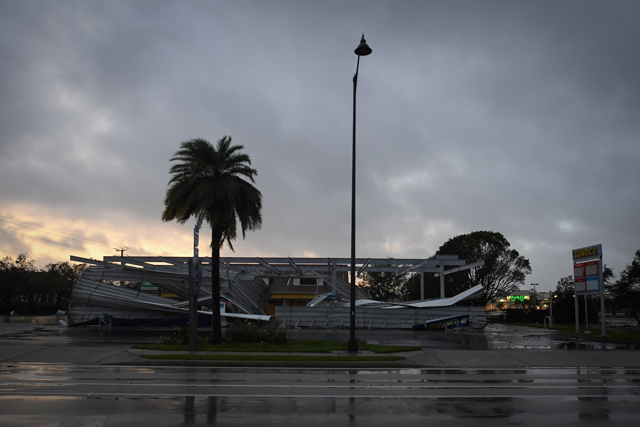 Hurricane Irma weakened to a Category 1 storm early Monday as it marched up the US state of Florida's northwestern coast, with its eye located about 25 miles (40 kilometers) northeast of the vulnerable Tampa area. Maximum sustained winds had decreased to near 85 miles per hour as of 2:00 am local time (0600 GMT), with Irma projected to become a tropical storm as it moved into northern Florida or southern Georgia later Monday. Warnings of dangerous storm surges remained in effect through vast swaths of peninsular Florida, where more than six million people had been ordered to flee Irma in one of the biggest evacuations in US history. "As little as six inches of moving water can knock you down," tweeted the state's governor Rick Scott following the downgrade. "Stay inside. Stay safe," he added. Irma was churning toward the heavily populated Tampa Bay region, a zone seen as particularly susceptible to storm surges due to its geographical position and sloping land off the coast. 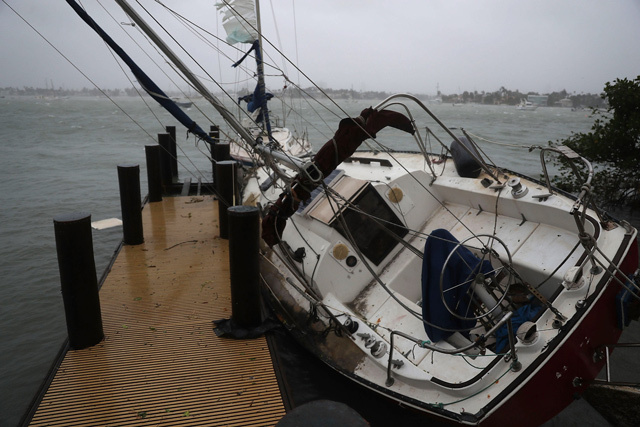 The storm had killed three people when it struck the southern Florida Keys island chain as a more powerful Category Four on Sunday. Irma has toppled cranes, swallowed streets and left millions without power after wreaking a trail of death and destruction through the Caribbean. The historic storm is so wide that authorities faced destructive storm surges on both coasts of Florida and the Keys as it follows a path north toward Georgia. 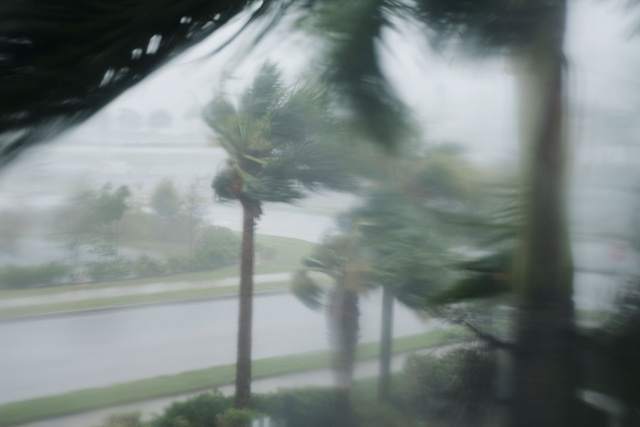 The 400-mile-wide (640-kilometer-wide) storm blew ashore in the mostly cleared-out Florida Keys, then marched up its western coast, its punishing winds extending clear across to Miami and West Palm Beach on the Atlantic side. There were no immediate reports of deaths in Florida. In the Caribbean, at least 24 were people were killed during Irma's destructive trek. 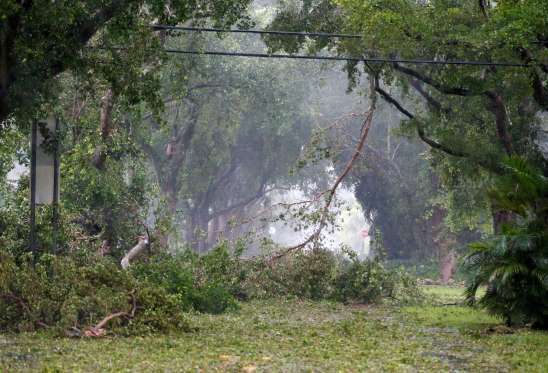 Bryan Koon, Florida's emergency management director, said late Sunday that authorities had only scattered information about the storm's toll, but he remained hopeful. "I've not heard of catastrophic damage. It doesn't mean it doesn't exist. It means it hasn't gotten to us yet," Koon said. In the low-lying Keys, where a storm surge of over 10 feet (3 meters) was recorded, appliances and furniture were seen floating away, and Monroe County spokeswoman Cammy Clark said the ocean waters were filled with navigation hazards, including sunken boats. But the full extent of Irma's wrath there was not clear. A Miami woman who went into labor was guided through delivery by phone when authorities couldn't reach her because of high winds and street flooding. Firefighters later took her to the hospital. An apparent tornado spun off by Irma destroyed six mobile homes in Palm Bay, midway up the Atlantic coast. Flooding was reported along Interstate 4, which cuts across Florida's midsection. While Irma raked Florida's Gulf Coast, forecasters warned that the entire state was in danger because of the sheer size of the storm. 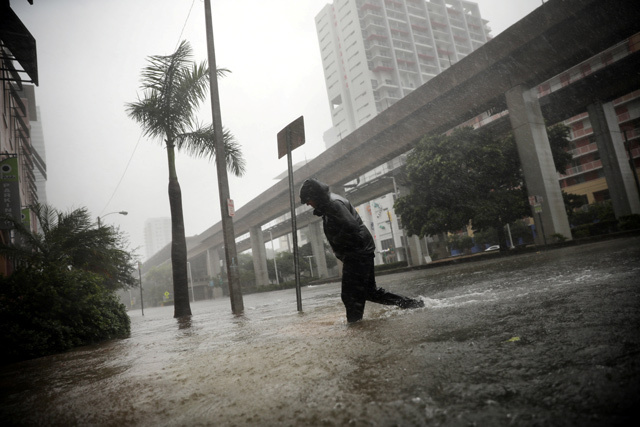 "Small boats floating down the street next to furniture and refrigerators. Very noisy," he said by text message. "Shingles are coming off." Irma made landfall just after 9 a.m. at Cudjoe Key, about 20 miles (32 kilometers) outside Key West. During the afternoon, it rounded Florida's southwestern corner and hugged the coast closely as it pushed toward Naples, Sanibel, Fort Myers and, beyond that, Sarasota, at 14 mph (23 kph). "I said, 'Let's go and live the good life in paradise'," she said. "And here we are." "I've been here with other storms, other hurricanes. 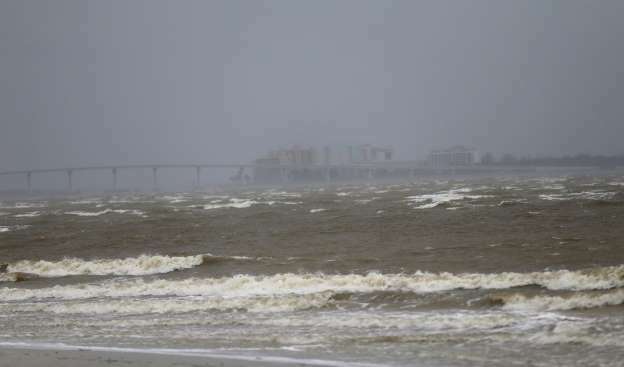 But this one scares me," Sally Carlson said as she snapped photos of the waves crashing against boats in St. Petersburg. "Let's just say a prayer we hope we make it through." Along the Gulf Coast, two manatees became stranded after Hurricane Irma sucked the water out of Sarasota Bay, in Florida's Manatee County. Several people posted photos of the mammals on Facebook amid reports rescuers were able to later drag them to deeper water. "Once this system passes through, it's going to be a race to save lives and sustain lives," Federal Emergency Management Agency chief Brock Long said on "Fox News Sunday." Florida's governor activated all 7,000 members of the Florida National Guard, and 10,000 guardsmen from elsewhere were being deployed. For days, forecasters had warned Irma was taking dead aim at the Miami area and the rest of the state's Atlantic coast. But then Irma made a more pronounced westward shift — the result of what meteorologists said was an atmospheric tug-of-war between weather systems that nudged Irma's crucial right turn into Florida's Gulf Coast.